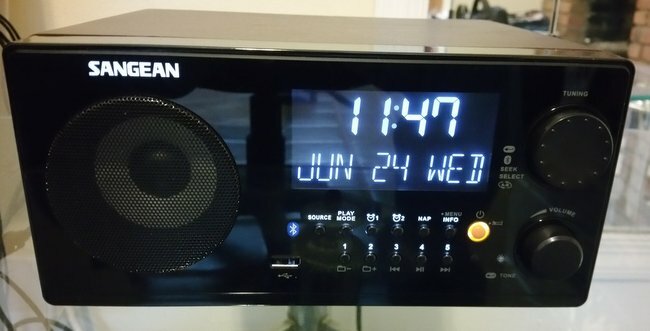 Many thanks to SWLing Post reader, Chris Freitas, who has informed me about a review he just published of the Sangean WR-22 AM/FM clock radio. Click here to read Chris’ full review on his blog. This entry was posted in AM, FM, News, Radios, Reviews and tagged Chris Freitas, Sangean, Sangean WR-22, Sangean WR-22 R, WR-22 on July 7, 2015 by Thomas. Chris, I am ready to buy the W-22. I want an easy system where I can send the local radio broadcast to my LG ear buds. Local sports broadcasts may be blocked on the internet. Could I stream the local radio to my earbuds using the W-22’s bluetooth? Well thanks to your review, otherwise I would not have known about this radio-clock-WMA-MP3 player; and I was getting desperate to source another replacement for the Sony. I also have a Roberts Radio WMA-MP3 Player a mini Hi-Fi music centre. It’s quite large but can be temperamental through the remote control, unfortunately most of the functions required are via the remote… the Sangean WFR-28 is interesting, a lot of features in this one, but as you say, no Bluetooth ? sort-of odd to leave this useful well tried wireless connection out; well it may appear in another model design ! I have purchased this receiver purely based on Chris review, and also having had an ATS 909X multi-band receiver, I considered the FM may be as good or better for the WR-22 in general, since I consider Sangean products as very good, and hoped the WR-22 would do the job that I was looking for… primary, I wanted a receiver to replace my not so old Sony clock-radio, model ICF-CL75iP; it has software issues since day one, even with the offered up-date it frequently locks-up and takes several hours to drain power, even with a reset before re-powering-up, (time off unpowered) allows it to re-boot; anyway, because I like to lull myself asleep with WMA music files, the problem is finding a good brand name. Having all ready been bitten badly some years ago, with a Yamaha music centre that had a wacky if not demonic music file system thus, I just became feed-up with it, and dumped into Hi-Fi hell, land fill with great pleasure. The current radio market, or in my case clock-radio with WMA & MP3 music files, is almost non-existent however, Sangean did produce a nice looking as such, RCR-4 that had passed me by ! And thus no longer in production… so, when I came across Chris review my eyes popped-out, wondering how I missed this radio that had all the features I required; Chris is correct in he’s assessment of the WR-22, the FM band has exceptionally good sensitivity, has allowed me for the first time, to receive stations from France on the internal FM aerial-antenna ? Wow… I made the judgement it’s using the old trick to couple via a condenser, into the mains cable, this serves as the internal antenna. Works well but, I prefer to use the external wire as supplied, realising it’s length has been cut for the centre FM band, and would provide a more reliable winter signal. Just in case you are wondering where I live, it’s in Jersey the Channel Islands… closer to France offshore from the bay of Saint Malo 39 Miles, than UK-England 120 Miles. Low priced clock-radios are a waste of time, so higher priced and in general, semi-Hi-Fi music centre units are the only option; this unit is not so big that it fits nicely on a bedside cabinet and looks good too; I have the white fascia model with a blueish back-light screen LCD, that illuminates the buttons and Sangean logo. It has a really great sound from the speaker, helped by the rear panel bass ported hole; as Chris has stated, personal sound quality and tone is fully adjustable; in fact this unit has a considerable amount of tweaks to play with, the clock-radio will automatically set the time out-of-the-box, if you have station’s with RDS-CT in your area, as one of the default setting. The WMA-MP3 USB input port, comes into it’s own here to provide a simple no fuss music playback; however with my unit the European model, the operation book lacks the clarification to let you know that Repeat-All-Random playback, is only adjustable via the remote control; otherwise all other functions on the radio conform to the manual… what is missing in the European model is an external aerial for AM band, it’s unfortunate because, I can receive Egypt on my Tecsun PL880, although it’s not that hot on sensitivity for AM medium-wave, and the WR-22 is rather deaf in comparison, but that’s the trend these days. The radio can also be powered via a 12 volt input socket at the rear panel; otherwise for the price of this unit it’s good value, quality, and sound; with lots of usable adjustable features to play with, the cabinet is genuine wood, in a dark simulated walnut colour. So, a BIG thanks to Chris, from me in Jersey the other side of the pond. Glad you are enjoying the Sangean WR-22, Brian! When I first purchased it back in July 2015, I was blown away with the shear quality of the radio. Sangean generally makes quality radios and this one is no exception. I have to admit that the WR-22 is my primary radio. Even the Tecsun PL-680 that I bought to review on my blog and podcast was given to my dad a few weeks ago, since I use the WR-22 to listen to all my favorite radio either on terrestrial radio or online via apps like TuneIn or Pocket Casts. If only Sangean can make a portable version of this radio (something similar to the WFR-28 but with bluetooth instead), it would be an instant buy. Thanks for linking to my review, Thomas!